Protests in Brazil are heating up preparations for the football World Cup. These demonstrations and other ways of using the streets of Brasília emphasize that the future did not turn out to be as utopian and rich as imagined before. Brasilia was designed for driving, not for walking. The city is shaped like an airplane, the so called plano piloto, and although some say it looks more like a tanga slip it was meant to show citizens what Brazil would look like in the future. The future would be modern, rational, and above all prosperous. The utopian dream was that everyone would own a car and drive from their modern apartment to work. Therefore, Brasília had to have long and wide roads that would get you from one of the airplane’s wings into the ‘cockpit’ where the government and ministries are situated. In this modern future walking would be a pastime exercise and not a means of transportation anymore. 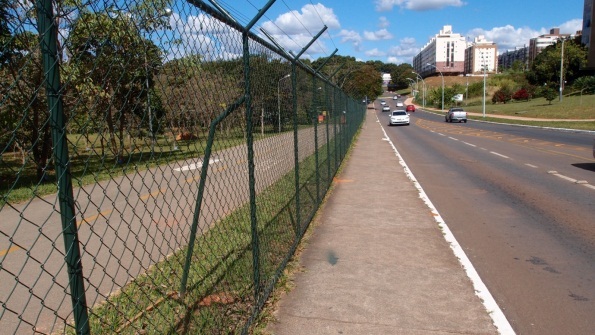 If the residents of Brasilia wanted to walk they would drive to one of the city’s parks. 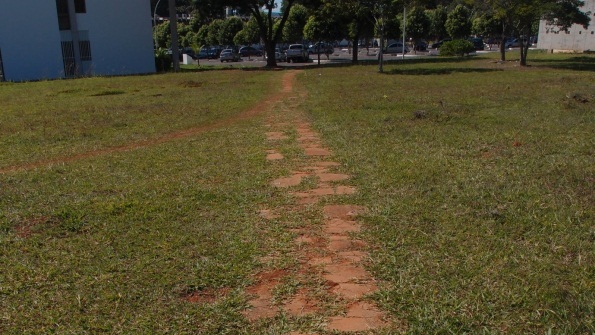 This would be the place to walk, jog, and maybe use one of the park’s fitness facilities while enjoying the nature that mankind dominated by building Brasília. After a pleasant and healthy walk people would take their cars back to their apartments. Today, 50 years after the city was built, the country has urbanised rapidly and people have not benefitted equally from economic growth. Brasilia is one of the most unequal countries in the world and most people cannot afford to live in one of the city’s apartments or buy a car. The majority of the population lives in one of the many ‘satellite cities’ that surround the plano piloto. In order to go to work they have to walk and take busses. But the straight and wide roads that were built for cars aren’t always suitable for walking. Over the years many ‘informal’ footpaths have emerged across the city. Some of these footpaths are hardly visible and can only be recognized by looking carefully at the length of the grass. Other footpaths are much more visible, like this one that is paved with pieces of concrete tiles and flat stones. Walking in the plano piloto can be pleasant and is safe in comparison with other Brazilian cities. At the same time it has become an important indicator of status. Today two forms of walking have emerged: people with cars walk in the park where walking is part of a healthy lifestyle whereas those without cars literally walk on the other side of the fence, which has a completely different meaning and is associated with a lower status. A student at the University of Brasília informed me that walking is something that people gossip about. If someone who generally arrives at the campus by car suddenly arrives on foot, one wonders why he is walking. Has he experienced some financial setbacks in his personal life? Was the car never his own and maybe borrowed from his parents? Is the car in the garage for repair? People are not expected to walk to the university for fun or health reasons as these kind of walks take place in the park. During the past weeks Brasília, like the rest of the country, has seen massive strikes and demonstrations, the largest protests since at least 20 years. Public transport was one of the main issues: buses had to be cheaper, even free, be more comfortable and not break down so often. The protesters wanted to have more freedom of movement. They wanted mobility in a physical and economic sense. On Monday 24 June protesters destroyed 16 busses that were parked at the city’s central bus station. They smashed windows, toppled busses over and set two buses alight. Brasília presented a modernist dream where all citizens own a car and live in an apartment; a dream where walking is a pastime exercise, not a necessity. Today’s protests however have highlighted that the plano piloto not only embodies a utopian modernity but also sharp everyday socio-economic inequalities. The architecture accentuates the division between residents in the plano de pilote and residents in the satellite cities; between people that take the car and people that take the bus; and between walkers in the park and walkers on the city’s many informal footpaths. “Informal footpath” is indeed a good name. It is curious how people never name these paths and never really talk about them even though they use them all the time. I really didn’t know how to call them! And they say a lot about how the city works, as they represent some easier ways to get from A to B where the sideways are always side by side to the traffic roads in the same directions, seem like to force pedestrians to walk as if they were in a car and close to the traffic which sometimes can be dangerous. Not to talk about having to be in constant sunlight as the city has a huge open sky area. Great that you talk about it, it makes the city even more interesting to know about!